OK. A lot of you reading this own a Rolex watch. Maybe you own several. Maybe you’re even a collector. But you started somewhere. Someone – maybe your dad or a wife or girlfriend – gave you your first Rollie. Or you bought it for yourself after achieving something big, some milestone in your life. Or you’re a vintage watch guy and your first was a Submariner 5513. But however it happened, you got your first one. Remember how that felt? A thrill at sliding it over your hand, clipping it to your wrist. Secretly hoping someone would notice, while acting like you didn’t care. Kid stuff, really. But I think that’s how most honest Rolex geeks feel. And that’s how I feel now. 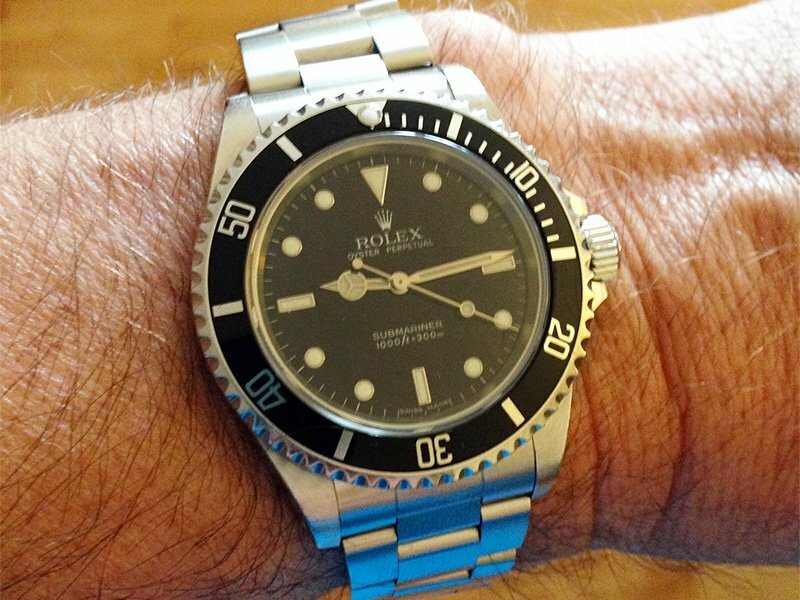 My compadré, Dave Kaiten, wrote about his first Rolex, the new “Batman” GMT-Master II, here and here. While Dave’s watch was new, mine is a 2004 Submariner No-Date 14060M. I foreshadowed its acquisition a while back on the Timekeeper forum’s blog. In that post, I mentioned the 1996 vintage 14060 we had on hold. Lo and behold, when we went to pick it up a couple of weeks ago, there in the vintage display case sat a 14060M from 2004. The M of course, means the movement was upgraded from the Rolex calibre 3000 to the 3130. The tool watch of modern Rolex tool watches. A friend of mine called it, “The last of the best.” I let the 14060 go in a heartbeat, and opted for the 14060M. Now, I’ve had nice watches before. My standard daily wear alternates between an Omega Speedmaster and a Breitling ChronoAvenger. But my thoughts about my new (to me) Rolex are much the same as Dave’s. The engineering is fabulous, the size is perfect. The look is simple. Not even a date display. Everything you need, nothing you don’t.